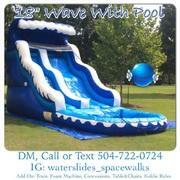 18'Ocean Wave With Pool is a very unique waterslide with nonstop fun for all ages. Ever wondered what it would be like to bring the ocean home hmmmmm!! Well this unit have a built in wave in the slide which allows sliders to have a chance to ride their own personal wave without actually going to the beach, but with a real experience. So let us bring the ocean to your front door!